carbon budget myth | No place like home. The last 3 posts have centred on the “Road” the I.P.C.C. , U.N.F.C.C.C. , Governments think tanks and business are approaching the near future, and the CLIMATE REALITY which science informs us is developing. Brand is aligned with “eco modernists” who see a “Good Anthropocene” where (obviously) technology blossoms, geo-engineering, negative emissions technology, carbon capture and storage on a MASSIVE scale and Genetically Modified Organisms miraculously produce twice as much food on the same land for the extra 3 billion people. Its nuclear fueled business as usual, the new normal. Is this the “new normal” for Iran ? I think a fork in the Road develops when the path advocated by the complete western negotiating process is heading for a climate catastrophe. So much information is missing from IPCC projections in the name of palatability and long term political blindness, that what is happening today is of no consequence until the next 7 year cycle reports are published. 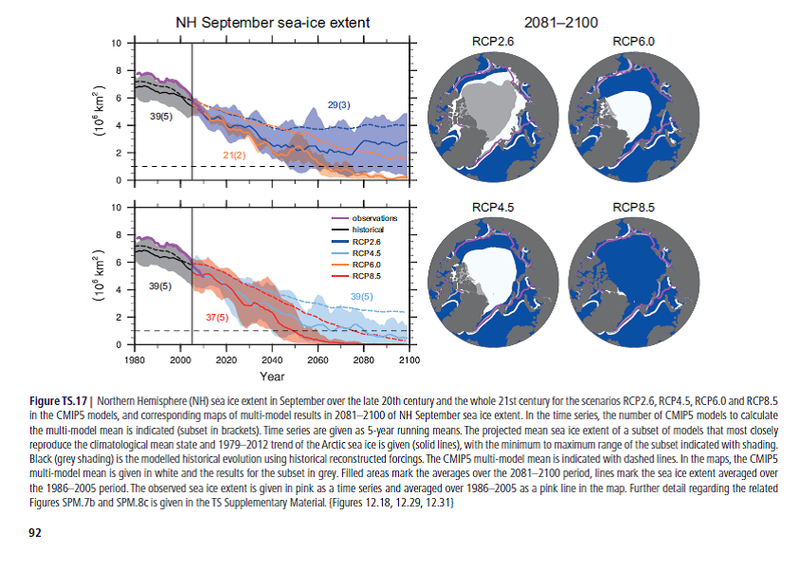 As detailed previously, in 2012 the summer Arctic Ice, (which has a MAJOR impact on northern hemisphere weather extremes, through the Polar Jet Stream), was 75% LESS than the average ice cover since measurements began. 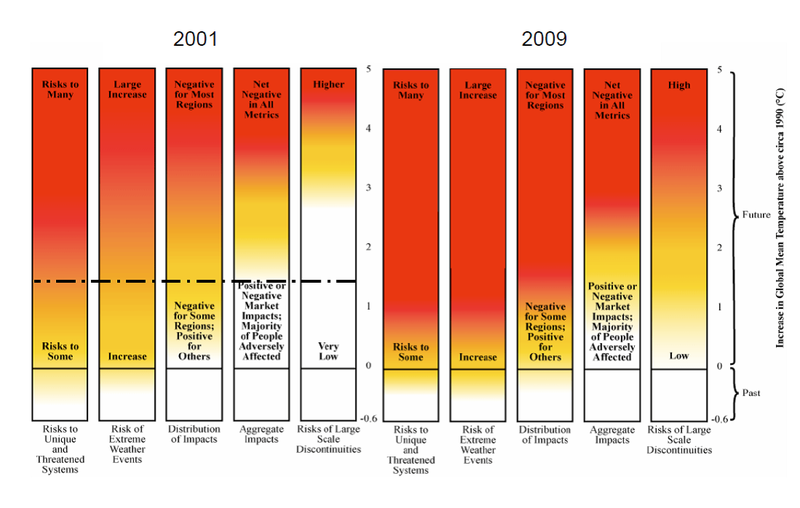 Bringing into play scenarios that the IPCC had not considered at all until after 2100. Things are happening at a MUCH faster rate than IPCC are arguing. What happens when lots of 150 kilometre diameter methane expulsions begin, or permafrost begins to melt. The IPCC has encouraged the thought of a “carbon budget” since the 5th AR report, and also redefined the terms of urgency of action. To keep temperatures below 2C based on the “science” and “equity”, was the promise of 2009. We MUST NOT exceed 2C is the correct emphasis as 2C has, through more research NOW been determined as “dangerous”. 2C now represents the border between “dangerous” and “very dangerous”. Emissions reductions trajectories at levels of “Representational Concentration Pathways” (RCP’s) of between 2.6 (which is the only “safe” trajectory), and RCP8.5, (which is the one we are on now), show the details. The scenarios are used to assess the costs associated with emission reductions consistent with particular concentration pathways. The RCPs represent the range of GHG emissions, they include a stringent mitigation scenario (RCP2.6), two intermediate scenarios (RCP4.5 and RCP6.0), and one scenario with very high GHG emissions (RCP8.5). 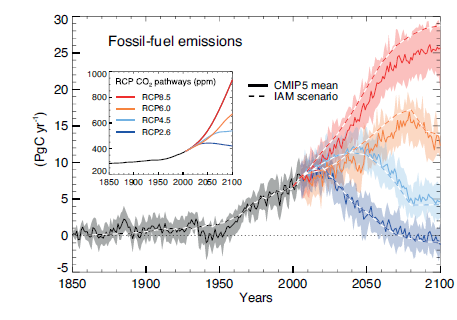 Scenarios without additional efforts to constrain emissions (‘baseline scenarios’), lead to pathways ranging between RCP6.0 and RCP8.5. RCP 2.6 is representative of a scenario that aims to keep global warming likely below 2°C above pre-industrial temperatures. The majority of models indicate that scenarios meeting forcing levels similar to RCP2.6 are characterized by substantial net negative emissions by 2100, on average around 2GtCO2/yr. Even the language of the urgency is gone, the change from “not exceeding” to the (only) path “likely” to prevent 2C warming. Recent press releases from Canete and Figueres say, “it doesn’t matter if we don’t reach a binding agreement in Paris as this is an ongoing process”, or “deep and steep emissions reductions AFTER 2050”. The 2013 IPCC reports have now “reduced the commitment” of NOT exceeding 2C, to >33%, >50%, and >66% “CHANCES of not exceeding 2C, best shot a 1 in 3 chance of failing. 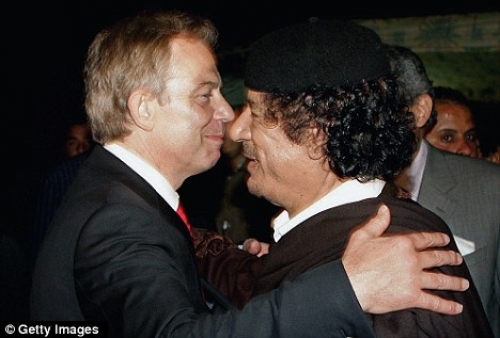 Would you cross the road, get on a plane or even leave the house if there was a 1 in 3 chance you wouldn’t return ? As can be seen from the following table, ONLY when we speak of 33,50 and 66% “chances” IS A CARBON BUDGET AVAILABLE. 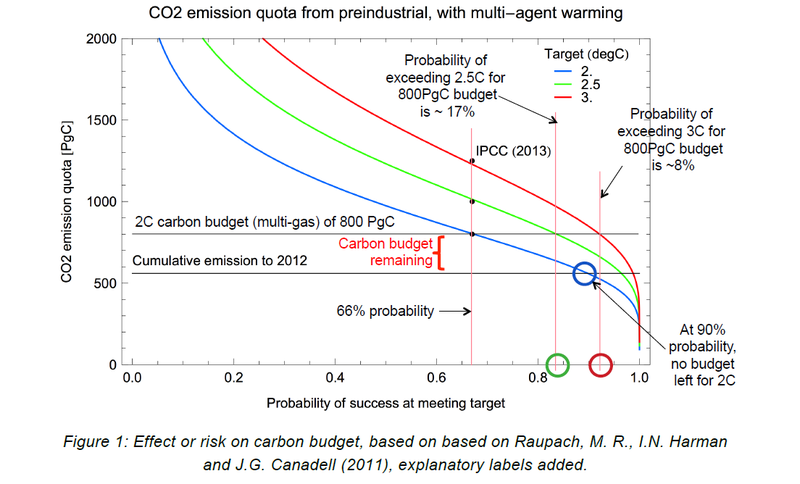 When we seek a “severe risk” equivalent of 90% “certainty” of AVOIDING 2C we see there is NO CARBON BUDGET. 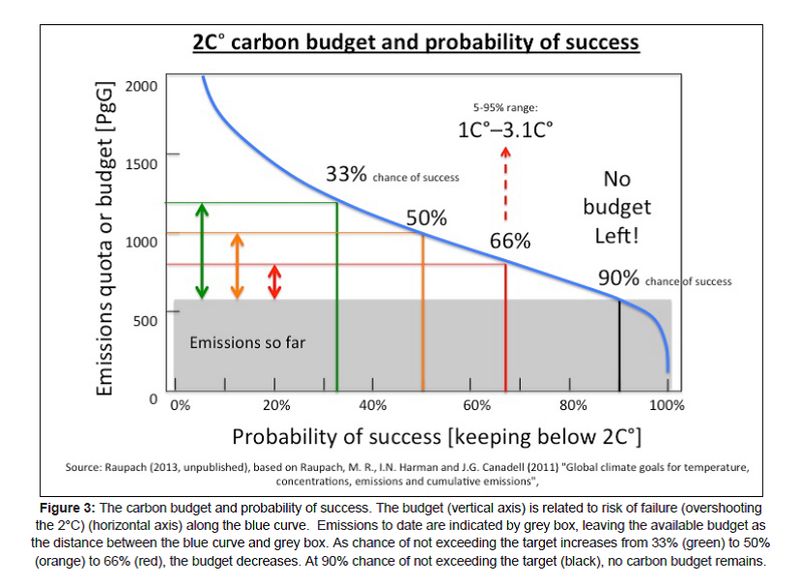 The IPCC’s AR5 report followed the “path” of 66% chance of staying under 2C but this budget “uncertainty” also brings the possibility of a 3C rise in temperature !!! David Spratt, Climate Code Red, The Myth of Burnable Carbon. Prof. Kevin Anderson has been outspoken on this issue for many years. He points out that the single most “crucial” issue facing reductions, IS WHEN WILL EMISSIONS PEAK ? Given the surge in emissions from Chinese modernisation and their attempt to peak their emissions in 2030, it is reasonable to assume that India (similar population) would not peak until 2045, Africa and Sth America in 2060. If Annex 1 countries are still emitting half of the current emissions, it would be very optimistic to assume a peak before 2030, before the remaining “carbon budget” is gone. You would notice Prof Anderson does not return emissions to zero on these graphs as it is felt impossible to reduce emissions from agriculture. 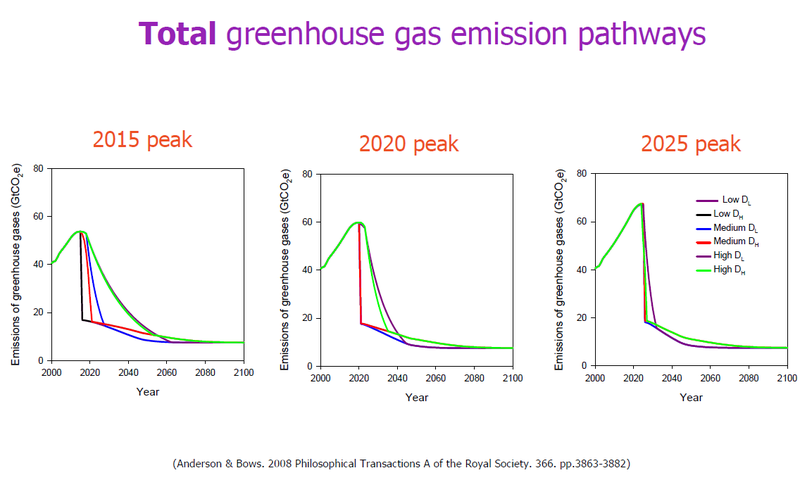 The later the “peak” the harder the reductions, bearing in mind that it is the area under the lines (cumulative emissions) which ensures a 2C outcome. 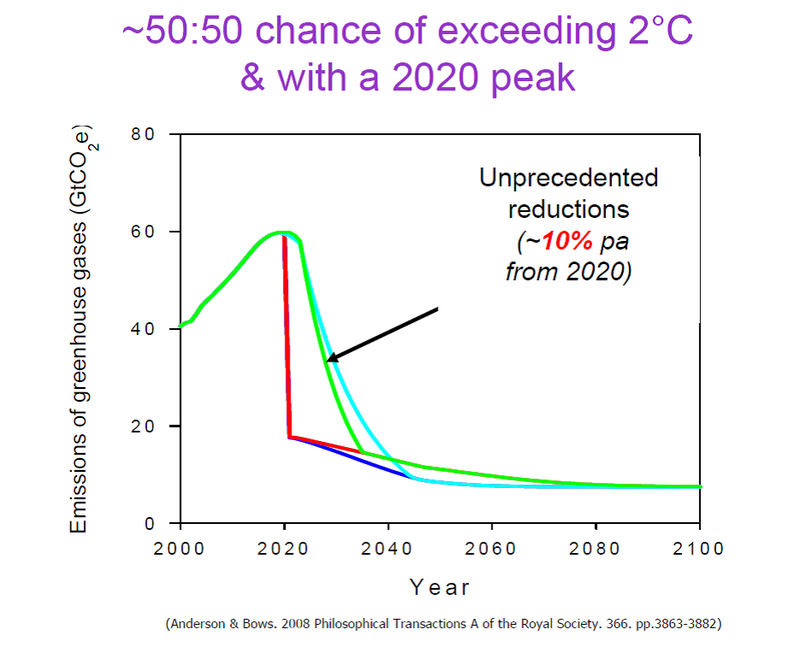 The 2020 peak (below) indicates the “unprecedented” 10% reductions trajectory giving only a 50/50 chance of staying under 2C. Anderson says there is no longer a non radical option, and for developed economies to play an equitable role in holding warming to 2C (with 66% probability) emissions compared to 1990 levels would require at least a 40% reduction by 2018, 70% reduction by 2024, and 90% by 2030. This would require “in effect a Marshall plan for energy supply”. Low-carbon supply technologies cannot deliver the necessary rate of emission reductions, and they need to be complemented with rapid, deep and early reductions in energy consumption, what Anderson calls a radical emission reduction strategy. 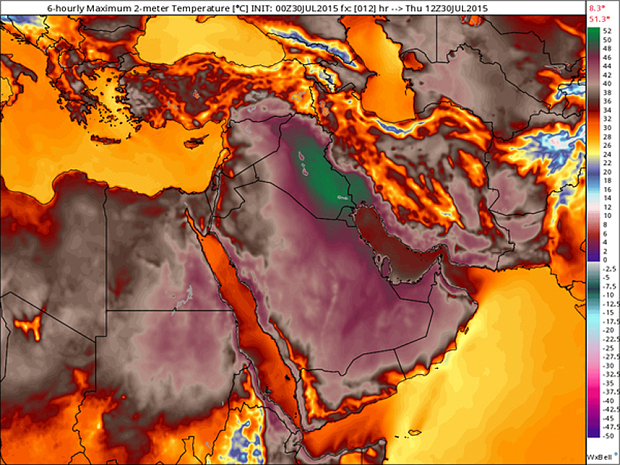 All this suggests that even holding warming to a too high 2°C limit now requires an emergency approach. Emergency action has proven fair and necessary for great social and economic challenges we have faced before. 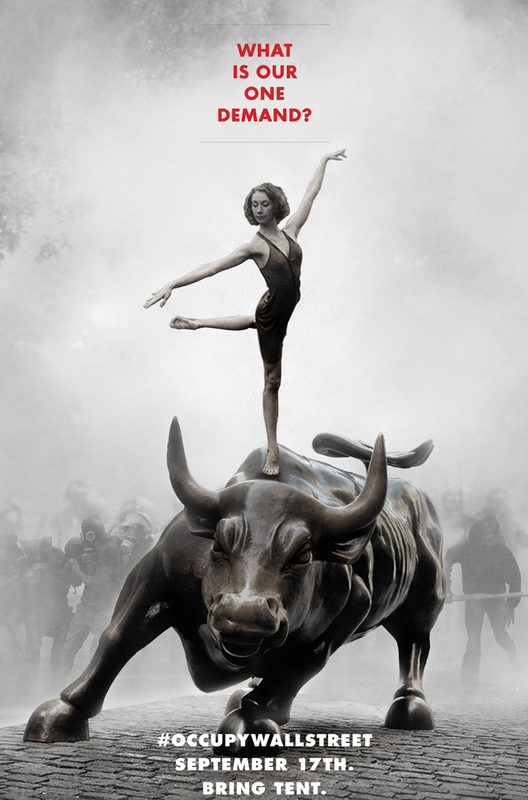 Call it the great disruption, the war economy, emergency mode, or what you like; the story is still the same, and it is now the only remaining viable path. David Spratt, The Myth of Burnable Carbon, Climate Code Red, 2014.